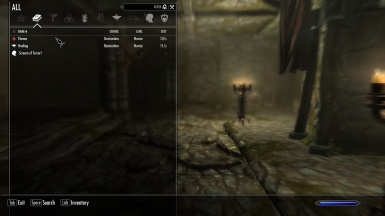 This mod would not be possible without SkyUILib. Hat's off to Schlangster and MrJack! 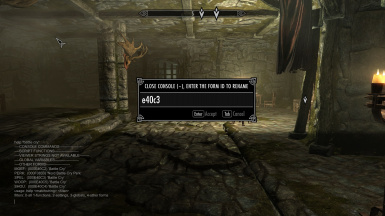 A very tiny change that removed Renamer modifications to the Skyrim DialogueFollower quest. This removes incompatibilities with follower mods such as AFT, UFO, EFF, and FM. You will no longer need patches for any of these mods. Added Rename Followers optional file. 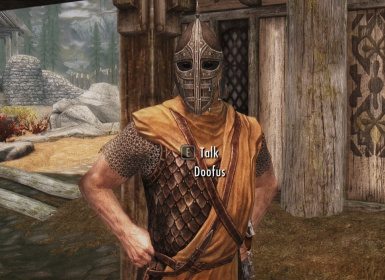 If you wish to rename NPCs after they have become followers, you will need to install this file. It is incompatible with follower mods such as AFT, UFO, EFF, and FM. Added routine to enforce renamed forms (spells, base items, etc.) on game load. Added ability to rename spells, perks, races, quests, and other forms not associated with physical objects. Added ability to globally rename objects, rather than only specific instances. Removed modified Stables quest as no longer necessary. Adds a more rigorous test to validate SKSE installation. This has been a common root to most user's problems. No other functionality changes so no need to update if Renamer is working for you. Added missing file to distribution which prevented renaming objects via inventory menu. Added a small tweak to DialogFollower Quest aliases, seeking to address disappearing dialog issue some users have reported. Added ability to select object to rename via command console. 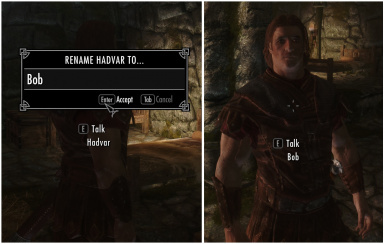 This provides a recovery workaround for NPCs whose dialog may disappear. General fixes to for mods and quests that override displayed names, especially for horses and NPCs. Added routine to test renaming success and provide diagnostic data. Fixed issue with MCM menu not loading for some users. 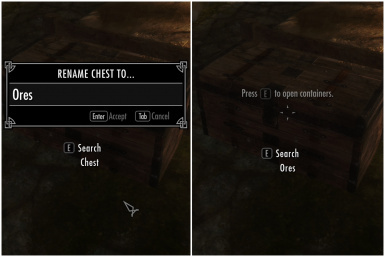 Adds ability to rename items from inventory menu. Added ability to rename locations. Resolved issues with named items sometimes reverting to original values. Resolved issues preventing use of reserved words such as "Clutter". Tweaked to allow renaming of player horses. Now includes SkyUILib files, so you don't have to install them separately. 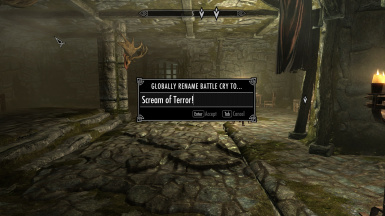 Jaxonz Renamer simply lets you rename anything in game. Just point your crosshairs at something, tap the hotkey (default: \) and type in a new name! Rename Spells, Perks, Races, and Quests *new! Renamer is fully compatible with DLC and 3rd party mods. It can even rename new objects introduced to the game. Renamer is known to conflict with some follower mods. See FAQ below for patches and fixes. Hot key is remappable to avoid conflicts. Adds no scripts to objects. Safely and easily remove Renamer at any time. Please review the Frequently Asked Questions list and the first page or so of comments before posting your question. Chances are it has been asked and answered already.